I've been obsessed with Taiko for a century and a half so this should be fun. I'm assuming you meant to write for a decade and a half. I wonder if Must Songs will get any DLC as I know the main Vita Taiko game does. Maybe the could have more songs from each vision per version like the rest of the arcade era songs for red and maybe the new OFA songs for blue. 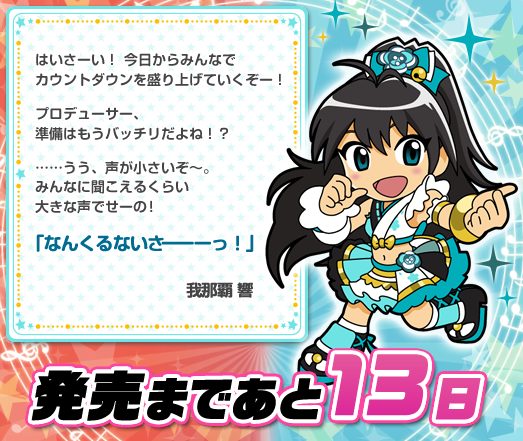 If there was any doubt this would be as featureless as Shiny Festa, prepare to squash them. Taiko no Tatsujin: V Version plays on PS TV. I'd have to guess these titles would too. So investing in a cheap PS TV wouldn't be a bad alternative. I didn't realize ps tv can play PS Vita games. Thanks, for letting us know. It seems like a lot of vita games are compatible with the ps tv according to the wikipedia list. That's good for people who don't want to spend $200 on a PS Vita. The ps tv is much cheaper. Must Songs is listed but it doesn't say if it's compatibility. But, likely it will be compatible. Unfortunately, I don't think I'm getting Must Songs. But, the ps tv looks tempting. Different song versions? Now I'm really hyped. Message: "Haisai! From today on let's get excited and count down with everyone! Producer, you're already completely prepared right?! ...Uu, your voice is too quiet. Next in a big voice so I can hear everyone, rea-dy! "Nankurunaisaaaaa!" - Ganaha Hibiki"
Nah, just emphasizing the fact that I love Taiko =P I played the console ports a bunch of times. Can I ask a dumb question? Anyone can answer. There was a song in the video Scotty posted where Chihaya, Yukiho, and Makoto are singing Little Match Girl. I don't think there was a music album that had all 3 of them singing at the same time. Just Chihaya and Yukiho. So, does that mean they used Stage for You (Ex. derived from One for All) for the songs in this game? I was thinking because that way you can get different versions of the same song by different idols. But, I could be totally wrong. They're not using the master version. I guess I was just wondering how they came up with the different idol combination for certain songs. I'm assuming they didn't do any new recordings for this game. Like the first song in the video was Mahou o Kakete. It seems all the idols were singing it, but there wasn't a prior recording of all of them singing together whether it's the master version or the short version (at least according to the wiki). So, I'm guessing they took the game version (short version) of each idol and combine it into one song, so that they're all simultaneously singing together. (It sounded like they were all singing every line together, but I could be wrong). As for Little Match Girl, they could have done something similar for Chihaya, Yukiho, and Makoto (since there's no prior recording of all of them singing together that song). So, I was thinking they take the game version of each idol and combine it together, so pretty much the Stage for You version for that song with those 3 idols. Anyways, I know I'm thinking too much into this. So, very sorry for the confusion and maybe stating the obvious (but could be wrong about everything I just said). I'm sure it's going to be a really fun game. Basically, you can buy different versions of the songs done by different idols (as shown on that latest video) with in-game money. That's pretty much it. They definitely do not work on PS TV. Enjoying Red version a lot. They definitely do not work on PS TV. Well, I did not expect that. Thanks, for the heads up. I'm not fluent on PS TV, but aren't there workarounds to blocked games? Though it seems that Taiko V Version also isn't compatible, so maybe it's just a Taiko thing. My package isn't due to arrive until Monday, but I'm curious if the game even allows for screenshots. Taiko V didn't allow them, but I think that's due to licensing.